The raging turmoil inside Jupiter’s missing – and slowly re-emerging – South Equatorial Belt can now be seen in unprecedented detail by the Keck II telescope’s Adaptive Optics system and its unique near-infrared camera. The heat from Jupiter's interior shines though the cold, high clouds in this spectacular 5-micron thermal infrared image. “The thermal IR senses breaks in the cloud cover,” said astronomer Mike Wong of the University of California at Berkeley. 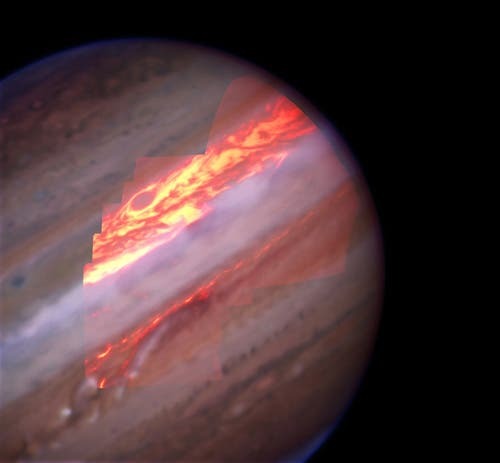 The thermal IR data is essentially showing heat from Jupiter’s interior being radiated into space. The three other IR bands, in contrast, are reflected sunlight. Put them all together and compare them to visible light images and scientists get a picture of a thinning, breaking layer of high, bright, icy clouds that have obscured the brown-red South Equatorial Belt (SEB) for about a year, making it look like a wide white zone.